We are opened from the May to of October! 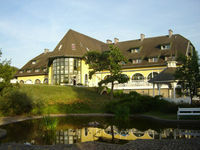 The hotel is located at a well known nice holiday resort, Zamardi on the southern shore of Central Europe's largest lake, the Balaton (800 meters away from the lake shore), at the slope of the hilly region of Somogy county, at the extension of the motorway M7 near the highway Nr. 70, 7 kms away from Siofok and 115 kms away from Budapest. The hotel offers careless recreation and relaxation ensured by a familiar atmosphere and various services to spend your free time. Our services are: halfboard, drink bar, conference halls (30-100 persons), 49 double rooms (several of them can be equipped with extra beds), 3 apartments, swimming-pool, sauna, hairdresser, table tennis, billiard bicycle rental. We undertake to organise family and company events. • Half board is available at 1200 HUF per person. • Rates exclude tourist tax (370 HUF per person per night).